Manchester City smashed six goals past Chelsea in the Premier League this week. And this is one of the heaviest defeats that the Blues have suffered in a long long time. Sterling put City in the lead during the 4th minute of the match and from then onwards it was the Sergio Aguero show. The Argentine scored a hattrick during the game while the other two were scored by Sterling and Gundogan. 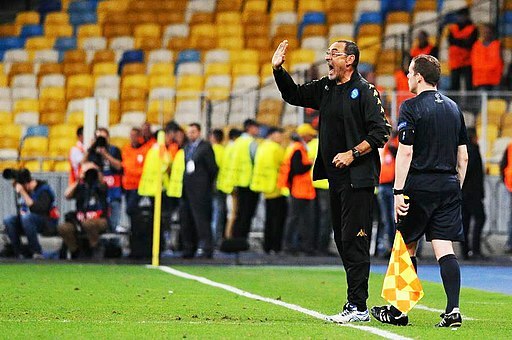 Sarri was left clueless after the match as to why his players performed so poorly but that hasn’t stopped the pundits from bashing the manager and his tactics. Almost every prominent pundit chose to put out some harsh words for the Italian manager but it was Jamie Carragher who might have made the harshest comment. While explaining, Chelsea’s poor tactics, Carragher compared the Blues with Arsenal. “Disgraceful, this is as bad as anything,” he said on Sky Sports during the half-time break. While the Arsenal fans will not like this comment but the reality is that the Gunners did have a slump in form while playing away from home a couple of seasons ago. But Arsenal could be forgiven since Arsene Wenger at that point of time had a series of average players amongst his squad. Chelsea, on the other hand, have some world class players but still, they are playing as if they have no interest in moving into the Champions League next season. After the defeat to Man City, the Stamford Bridge outfit have slipped down to sixth on the Premier League table. Previous articleHere’s how Man United could line up vs PSG: Will Marcus Rashford and Lindelof start? Next articleLiverpool could part ways with one of their most versatile players during the summer window: But why?